Over the years, various people in my family have battled their way through different (sometimes chronic) illnesses. To be honest, from a young age, I’ve seen people I love, be limited by health circumstances and as a family, it’s just something we understood and adjusted to. It’s possibly for that reason, as a family, we have a fairly dark sense of humour. When my dad was in hospital after a heart attack, I told him off for interrupting my lunch and forcing me to skip dessert. Or on other occasions, when facing an uncertain diagnosis, one of us has joked, ‘ah well, we’re all going to heaven anyway. Some just sooner than others’. Dark humour maybe, coping mechanism possibly, but also, rooted in truth. The reality is, when you are exposed to ill health, it can make you bitter, OR it can make you aware of the fragility of life and even more grateful for eternity. This life is simply not all there is. There is something more, way beyond anything we can see or feel. These experiences force us to take a cold look at reality, at what life would be like without that person, but also to understand that when you’re a believer in Jesus, absence is temporary. Eternity is forever. And when you know that, it makes you a weeble, not a whiner. Remember weebles? Little solid toys we played with as kids? No matter what you did to them, you couldn’t knock them down. They’d rock, they’d roll, but they couldn’t be pushed down for long. They’d soon pop back up. When you know Jesus, it’s not unrealistic to live this way. It might seem odd to onlookers, they might even dismiss it as ‘denial’, but the truth is, when we put our hope in Jesus, he centres us and plants eternity in our hearts. In the interim, we can pray for healing, we can expect God to do great things, but regardless, we can know that whatever happens to our human bodies, we will be ok.
No, no one wants to die prematurely. No one wants to see the people they love get sick. But at the same time, we are not living just for the here and now. We’re living with our eyes firmly fixed on eternity. This is true if we’re sick or if we’re not. This life is really only the Hors d’oeuvre for the main course that is to come. With that knowledge in our hearts, it gives us the strength (like a good old fashioned weeble) to get back up again. It doesn’t stop us from going through pain, sickness, worry or even death. But it gives us a hope to hang on to, even in the toughest of times. Brought a tear to eye, must’ve a family that trusts in God ! Great encouragement, thank you Paula . 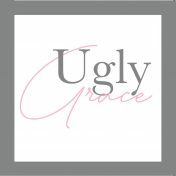 Ugly Grace, Blog at WordPress.com.